New dates for 2019! 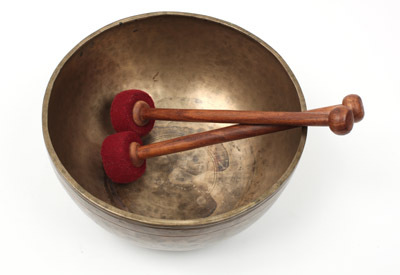 Tibetan Bowl meditations are offered on the second Friday alternating months with gong meditations at 309 Yoga. Cost is $13. Bring mats, blankets, pillows or whatever you need to be comfortable on the floor. Chairs are also available. Don’t forget to share and invite your friends via the Facebook event page too! What does the sound from the bowls actually do? It aligns your physical, emotional, and spiritual energies. What is the difference between old and new Himalayan (Tibetan) Singing Bowls and crystal bowls? Ancient singing bowls come from different areas in the Himalayan mountain range, such as Tibet, Bhutan and Nepal. Although their exact age is not known, many of them have been dated back hundreds of years. Made out of a consecrated 7 metal alloy prayers and mantras were chanted during the process of their creation. New bowls are usually made from three metals and may be made by machines instead of hand hammered. Becky has a combination of bowls that were made in Tibet as well as new metal bowls, but each is selected for the sound it projects. Crystal bowls are produced to create a particular note, often that corresponds to one of chakras. The original Tibetan bowls do not correspond to a particular note and often produce a range of sounds that may cover a complete octave. Himalayan bowls work via vibrations that effect all levels (spiritual, physical and emotional) and the bowls treat the whole being rather than just one energy center or part of the body. Many people report that in addition to pain relief, they feel a deeper sense of happiness and well-being. Becky hosts sound meditations every second Friday at 309 Yoga alternating between the Tibetan Bowls and gong. Becky Cobb is a certified reflexologist and vibrational energy worker. She combines sound, oils, flower essences, and crystals with her body work allowing your body to align to higher vibrations and self healing. Her current focus is on how emotions and stress interfere with our ability to be happy and healthy. She has developed a series of classes using her years of experience in counseling, studying health with vibrational healing to help you unwind and release emotions that have been trapped in your body.